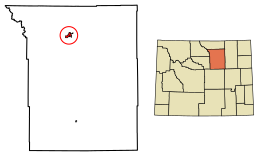 Location of Buffalo in Johnson County, Wyoming. Buffalo is a city in Johnson County, Wyoming, United States. The population was 4,585 at the 2010 census. It is the county seat of Johnson County. In recent years, the town has boomed economically due to methane production from the coal bed methane extraction method used in the Powder River Basin and surrounding areas. Even though energy is a vital part of its economy, agriculture and tourism are two other major components. Buffalo is at the foot of the Bighorn Mountains, so recreation is a short distance away. Many generational ranchers still run cattle and sheep over the highly productive terrain. As of the census  of 2010, there were 4,585 people, 2,080 households, and 1,198 families residing in the city. The population density was 1,028.0 inhabitants per square mile (396.9/km2). There were 2,300 housing units at an average density of 515.7 per square mile (199.1/km2). The racial makeup of the city was 95.5% White, 0.3% African American, 1.6% Native American, 0.7% Asian, 0.8% from other races, and 1.2% from two or more races. Hispanic or Latino of any race were 3.5% of the population. There were 2,080 households of which 26.8% had children under the age of 18 living with them, 45.4% were married couples living together, 8.7% had a female householder with no husband present, 3.6% had a male householder with no wife present, and 42.4% were non-families. 37.8% of all households were made up of individuals and 15.3% had someone living alone who was 65 years of age or older. The average household size was 2.17 and the average family size was 2.88. The median age in the city was 42.2 years. 23% of residents were under the age of 18; 6.6% were between the ages of 18 and 24; 23.4% were from 25 to 44; 27.7% were from 45 to 64; and 19.4% were 65 years of age or older. The gender makeup of the city was 50.1% male and 49.9% female. As of the census  of 2000, there were 3,900 people, 1,718 households, and 1,042 families residing in the city. The population density was 1,104.8 people per square mile (426.6/km²). There were 1,842 housing units at an average density of 521.8 per square mile (201.5/km²). The racial makeup of the city was 96.46% White, 0.10% African American, 0.82% Native American, 0.05% Asian, 0.54% from other races, and 2.03% from two or more races. Hispanic or Latino of any race were 1.82% of the population. There were 1,718 households out of which 26.1% had children under the age of 18 living with them, 48.8% were married couples living together, 8.4% had a female householder with no husband present, and 39.3% were non-families. 35.3% of all households were made up of individuals and 16.1% had someone living alone who was 65 years of age or older. The average household size was 2.21 and the average family size was 2.88. In the city, the population was spread out with 23.1% under the age of 18, 5.6% from 18 to 24, 22.6% from 25 to 44, 27.1% from 45 to 64, and 21.5% who were 65 years of age or older. The median age was 44 years. For every 100 females, there were 93.5 males. For every 100 females age 18 and over, there were 89.4 males. The median income for a household in the city was $29,392, and the median income for a family was $40,683. Males had a median income of $28,716 versus $19,688 for females. The per capita income for the city was $19,054. About 6.7% of families and 10.4% of the population were below the poverty line, including 7.0% of those under age 18 and 12.4% of those age 65 or over. The Wyoming Department of Health Veteran's Home of Wyoming, an assisted living facility for veterans and their dependents, is located in Buffalo. The facility was operated by the Wyoming Board of Charities and Reform until that agency was dissolved as a result of a state constitutional amendment passed in November 1990. Buffalo also has an airport named Johnson County Airport/KBYG. The Mini Publications Center is a Wyoming non-profit and registered 501 (c)(3) organization  dedicated to helping regional community and small businesses grow and prosper through free and low cost community services using both print and online media journalism focused on the needs of rural communities. MPC runs an internet café, has a local gallery in the café, and is starting its 14th year publishing a free local community newspaper, The Mini, published twice a week. An online version, BigHornMountainExpress.com, expands to include the whole Big Horn Mountains region of north central Wyoming. MPC runs the BigHornMountainExpress.com as a rural community news site, as well as an educational website, instructing how to write about the arts, their community and small business advice. The MPC is also working to create a community learning or community college course certification in running a rural community news service and for developing citizen journalists of all ages and backgrounds. They adhere to the best principles of citizen journalism for rural communities. KBBS AM 1450 "Classic Country"
KHRW FM 92.7 "The Eagle"
KLGT FM 96.5 "KIX 96.5"
KZZS FM 98.3 "The Peak"
Buffalo is located near the northern terminus of Interstate 25, where it joins with Interstate 90. Buffalo, Wyoming at the base of the Bighorn Mountains. Buffalo experiences a semi-arid climate ( Köppen BSk) with cold, dry winters and hot, wetter summers. Jim Gatchell Memorial Museum in Buffalo, Wy. Chris Prosinski Safety for the Chicago Bears. Previously played for the Jacksonville Jaguars and Philadelphia Eagles. Constantine Scollen missionary and resident priest from 1893 to 1894. ^ " Veterans' Home of Wyoming Archived 2009-05-13 at the Wayback Machine." Wyoming Department of Health. Retrieved on December 12, 2010. "Veterans’ Home of Wyoming 700 Veterans’ Lane Buffalo, WY 82834-9402." ^ " Buffalo city, Wyoming." U.S. Census Bureau. Retrieved on December 12, 2010. ^ Zhao, Emmeline (November 13, 2011). "High School Football Coach Issued Shockingly Offensive 'Hurt Feelings' Survey". Huffington Post. ^ "Monthly Averages for Buffalo, WY". The Weather Channel. Retrieved January 13, 2011. ^ "Mathew W. Pitsch". arkansashouse.org. Retrieved April 9, 2015. ^ "About Buffalo". Buffalo Registered Agents. Retrieved 7 July 2014. Wikimedia Commons has media related to Buffalo, Wyoming. "Buffalo. A town and county-seat of Johnson County, Wyo." . New International Encyclopedia. 1905.